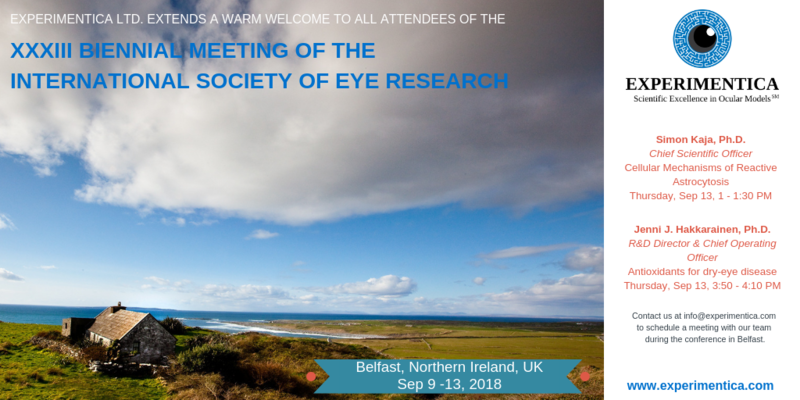 The XXXIII Biennial Meeting of the International Society of Eye Research takes place this year from September 9-13th in Belfast, Northern Ireland, UK. Dr Jenni J. Hakkarainen – Acting COO of Experimentica Ltd. will present an oral presentation on a metalloporphyrin superoxide dismutase mimetic and the dry-eye disease. Dr Simon Kaja – CSO of Experimentica Ltd. will chair a session and present on cellular mechanisms of reactive astrocytosis and opportunities for glioprotection. Kuopio, Finland, September 08, 2018 --(PR.com)-- Experimentica Ltd. announces its participation in the scientific sessions at the biennial meeting of the International Society of Eye Research. The event takes place September 9th – 13th at the Belfast Waterfront Meeting Centre 2 Lanyon Place, Belfast, BT1 3WH. Through its participation in this year’s ISER meeting Experimentica Ltd. is proud to be able to showcase its scientific know-how as well as its world-class researchers through its presentations and abstracts. It is our hope that attendees will feel free to make contact with them in order to discuss their scientific research as well as the Experimentica Ltd. product offering. Experimentica Ltd. extends a warm welcome to all attendees at this years meeting. Ocular Pharmacology, Therapeutics and Drug Discovery, Meeting Room 3A 13.09.2018 13:00-15:00.